The Mysore kings, Wadiyars, were subordinates of the Vijayanagara emperors. They declared independence at the decline of the empire in 1610 AD and tried to retain the latter’s goodwill by continuing the traditions started by them. Raja Wadiyar, the founder of the Mysore kingdom, started the Navaratri festivities in order to celebrate his new - found freedom, and issued an order that the days be observed with piety and splendor by one and all. 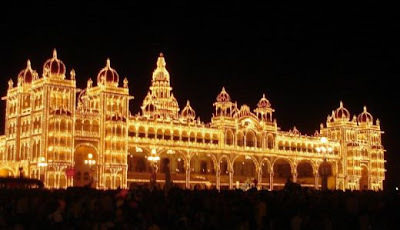 Initially, as the rulers had their stronghold in Srirangapatn, now a satellite town of Mysore city, the festival continued undisturbed even during the annexation of Mysore (then state) by Hyder Ali and followed by Tippu Sultan’s rule between 1761 and 1799.When Mysore State was restored to Mummadi (lit. ‘ third’)Krishnaraja Wadiyar in 1799, the capital was shifted to Mysore city from Srirangapatna, and the Navaratri festivities began to be performed with greater magnificence in the new capital with the introduction of a special durbar (‘audience’ or ‘royal assembly’) for the Europeans, and direct participation by the common masses. The attendance of the Europeans indicates the friendly ties that the king had with the colonial rulers, apart from the spreading of the popularity of the event in western media. The festival became a tradition of the royal household and reached its zenith during the rule of Nalvadi (lit. ‘the fourth’) Krishnaraja Wadiyar (1902-1940 AD). The wooden royal palace of Mysore City was famous for its intricate carvings and embellishments of gold and precious stones. Swami Vivekananda during his itinerant days was a royal guest and had several sessions with the king in this palace. Unfortunately, the palace was destroyed in a fire accident in 1897 and a new palace was built in its place by 1912, surpassing the glory of the previous one with the introduction of electrification and European expertise. The royal durbar, the procession of caparisoned elephants with the king seated in a golden howdah (throne with a canopy) followed by his ministers, administrators, the royal staff and the military came to an end with the taking over of all the kingdoms by the Indian Union in 1947. The last crowned king, Sri Jaya Chamarajendra Wadiyar, tried to revive the tradition in his personal capacity after a few years, but the old charm was missing. 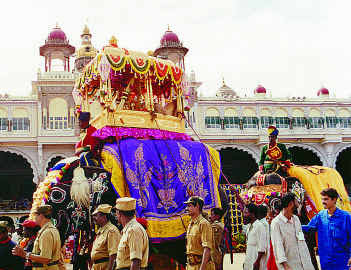 With the annexation of states from kings by the national government, and upon the demise of Jaya Chamarajendra Wadiyar in 1974, the tradition again suffered a setback and Mysore almost lost its unique festival until the Government of Karnataka decided to celebrate it as a state fiesta minus the royal entourage. Today, on the occasion of the world famous Jambu Savari or Dasara procession on the dasami day, apart from NCC, Scout, and other school and college student displays, tableaus depicting the land’s culture and history, fold-art performances, etc, and volunteer groups follow the caparisoned elephants, one of which (Drona has been doing it since many years) carries the image of Goddess Bhuvanesvari Devi. Bhuvanesvari (a name of Mahisasura-mardini), incidentally, is the goddess of Mysore, and she is none than Durga. She has a temple situated on the hill in Mysore – The Chamundi Hill. There is also the mythological legend, saying that it was on this hill that Mother Chamunda killed the demon Mahisa. In a Bengali article published several years ago in Desh, a famous researcher who conducted a through research on where exactly Durga worship started, says that Mysore is perhaps one of the oldest place of Mother worship. And the reason? It was here that the Mother killed the demon. Apart from the procession, a carnival providing the latest gadgets and amenities to the general public with attractive displays and amusements for all age groups is also being held since 1877. Celebrated musicians, dance and theatre groups perform and add color to the celebrations.